Lay a strong foundation for a balanced canine athlete during this six-week program. Develop the bond and focus your dog will need to be successful in any sport while learning basic agility skills that promote fun and safety. Learn how to motivate and calm your dog, creating an on/off switch that will help you in dog sports and everyday life. 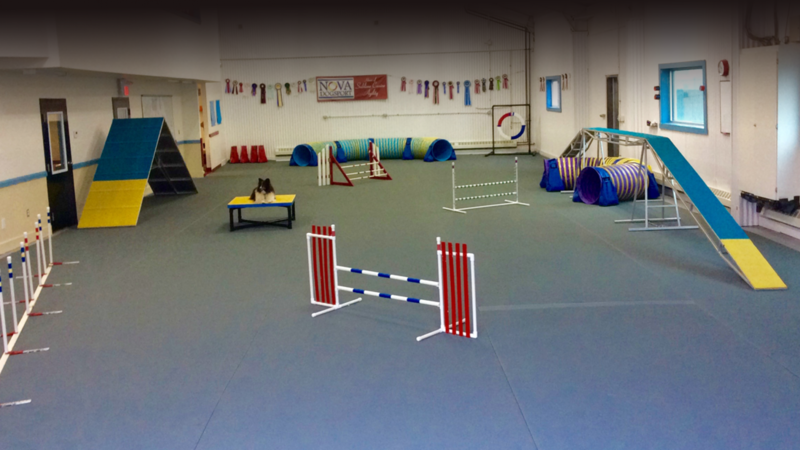 This course concentrates on developing an agility handling system so you and your dog can navigate an agility course. Jumps and a tunnel will be introduced in the last 2 classes. The cost is $140 plus tax ($50 non-refundable deposit required, from the total). Classes will have 3 to 7 participants. Your dog should have a good understanding of basic obedience behaviours including loose leash walking, recall, settle on a mat, sit and down. Your dog should be comfortable and capable of working around other dogs. It is recommended to have completed a group basic obedience class prior to participating in Agility Foundations. If you are unsure if your dog is suitable or ready for this class email lindsay@novadogsport.ca, a short meeting can be arranged if necessary. Breeds – As long as they are in good physical shape, this class is suitable for most breeds and sizes of dogs. Puppies – This class is suitable for puppies over the age of 5 months. Running is minimal, sessions are short and jumps are very low, so it’s safe on their developing bodies. This class is more of a mental workout than a physical one. For questions about this class email lindsay@novadogsport.ca or call 902-402-4127.